Have you left your pool a little long between cleans and maintenance tasks? Woken up one weekend to find it a little green? While getting your pool back to sparkling isn’t too difficult, it’s not a task a lot of pool owners have time to do. Home Style Fishponds can bring your pool back, and have you swimming and relaxing after work and on weekends before you know it. Did you know that if your pool doesn’t receive the right maintenance, it can go green overnight? Maintaining your pool on a schedule is important, and will result in lower maintenance costs in the long term. There are plenty of things that can turn your pool green with algae being the main cause. The team at Home Style Fishponds can test and treat your pool to get rid of the algae and offer regular maintenance services to ensure it doesn’t come back. 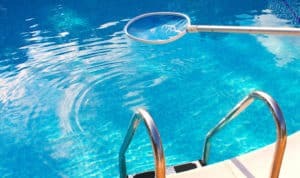 Maintenance for green pools often includes checking the PH levels, cleaning your pump, shock treatments, algaecide treatments and waste removal (leaves etc). At Home Style Fishponds, we’re aiming to get the algae spores out of the pool to stop them growing. Pool filters also play a large role in ensuring your pool is clean and free of algae. Your filter will need regular cleaning – a clogged and dirty filter needs to work harder, costing you more money in power, more time in cleaning the pool (because the filter can’t do its job efficiently) and have more risk with something going wrong. We also offer regular pool maintenance by balancing out the chemicals (usually salt and chlorine) in your pool. We take care of supplying the product and making the necessary adjustments to ensure you have a healthy looking pool. If you want a sparkling clean pool all year long, the team at Home Style Fishponds are here to help. Call us today to book your first pool clean.